S&P is your one stop source for heat treating services. Our customers benefit from an Aerospace and ISO 9001 certified staff. We are also Nuclear, Ford, and GM approved. We have been able to do this by investing in new technology and training the best, most competent staff in the heat treating business. 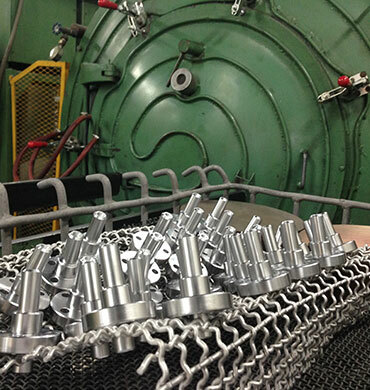 S&P Heat Treating, Inc. serves a wide range of manufacturing businesses, large and small. We take pride in offering the same level of service to all our customers, whether it is a non-machined blank of raw material, to an intricate valve component for a nuclear power plant. All of our customers will receive our undivided attention, and we will customize a process to fit your specific needs. To learn more about our heat treating services please contact us or give Mike Rapoza a call today. We are always happy to answer any questions, or to provide a free quote. We proudly serve our customers in the states of Rhode Island ( RI ), Massachusetts ( MA ), Connecticut ( CT ), New Hampshire ( NH ), and throughout the USA. Navy, Ford, GM, Nuclear and Aerospace approved.